Gazpacho - "Get It While It's Cold"
The 7-song EP debut of Norway's Gazpacho displays a brand of mellow, slightly spacey pop music that takes its cue from influences such as the latter day Steve Hogarth version of Marillion and fellow countrymen A-ha. Although the band's name happens to be that of a Marillion tune, they say there was no connection. 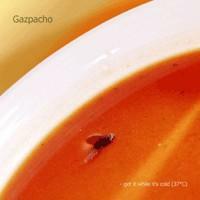 Gazpacho, as they reasoned, is soup that is cold, which they kind of thought was a contradiction in terms; something they hope comes out in their music. So how is their music? Well, we're talking generally mellow pop, focusing less on solos and more on texture and melody. Gazpacho throws in some interesting touches, such as the space sounds on Sea of Tranquility, the intriguing rhythms of Delete Home, and the Celtic influences on Bravo, but their music is occasionally undermined by trite lyrics about relationships and overly emotional declarations of love. Not to say all their lyrics are like that. Sometimes, as in the verses of Sea of Tranquility, they weave some wonderful poetic imagery that fits perfectly with the music. Get It While It's Cold is certainly a pleasant listen, though there is not too much to challenge listeners here. But occasionally it's nice to just sit back and relax, without worrying about being challenged. Gazpacho is engaging enough to fill those times with some decent listening. For more information you can visit the Gazpacho web site at: http://www.gazpachoworld.com. Hear sound files at the Gazpacho Mp3.com web site at: http://www.mp3.com/gazpacho.